For the first time in the history of Indian stock markets, trading was halted at the upper circuit one minute after trading began on Monday in reaction to the United Progressive Alliance's impressive victory in the general elections. Trading was then been halted for two hours, but as soon as the market reponed the indices hit the upper circuit again, and trading has been halted for the entire day today. The S&P CNX Defty is S&P CNX Nifty measured in dollars. This index hit the upper circuit of 20.53%, leading to a halt in trading for the entire day. 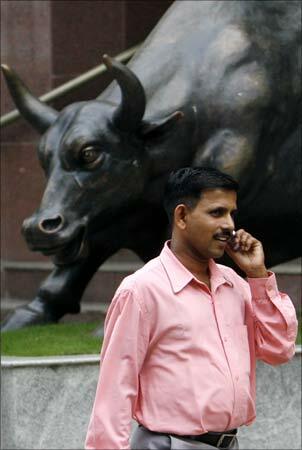 Earlier in the day, the Sensex opened 10.73 per cent or 1305.97 points higher at 13479.39. The National Stock Exchange's Nifty was locked at 4203.30, higher by 14.48 per cent or 531.65 points. All sectoral indices shot through the roof with the banking sector leading the rally. With the air of political uncertainty clearing up with the triumph of the United Progressive Alliance, the bulls have returned to the bourses with a bang. The mood in the market is euphoric and most analysts and market observers believe that the Sensex might rise to 14,000 by the time the new government presents the Union Budget. 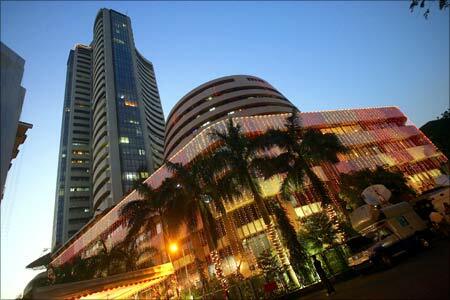 Image: The Bombay Stock Exchange is lit up during Diwali. The Bombay Stock Exchange in a statement said on Monday morning that that trading has been halted because market has hit index based market wide circuit filter limit. The market wide circuit breakers would be triggered by movement of either Sensex or the NSE S&P CNX Nifty whichever is breached earlier. In case of a 10% movement of either of these indices, there would be a 1-hour market halt if the movement takes place before 1 p.m. In case the movement takes place at or after 1 p.m. but before 2.30 p.m. there will be a trading halt for hour. In case the movement takes place at or after 2.30 p.m. there will be no trading halt at the 10% level and the market will continue trading. In case of a 15% movement of either index, there will be a 2-hour market halt if the movement takes place before 1 p.m. If the 15% trigger is reached on or after 1 p.m. but before 2 p.m., there will be a 1 hour halt. If the 15% trigger is reached on or after 2 p.m. the trading will halt for the remainder of the day. In case of a 20% movement of the index, the trading will be halted for the remainder of the day. 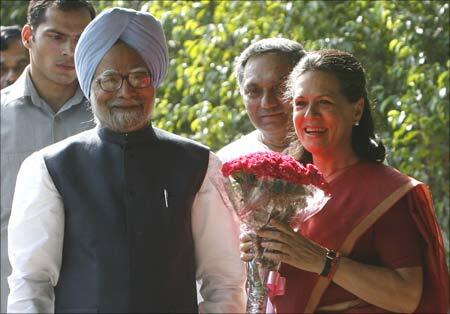 Image: Congress Party chief Sonia Gandhi holds a bouquet presented by India's Prime Minister Manmohan Singh in New Delhi. There is an unprecedented sense of jubilation among investors, as they expect a big thrust on the reforms front. Market pundits had earlier said that they expect a huge rally for the 30-share Sensitive Index of the Bombay Stock Exchange and the NSE Nifty during the coming week as foreign institutional investors start pumping in fresh funds that have been awaiting clarity on the political front so far. Market experts said the Left-less victory of the UPA over BJP-led National Democratic Alliance not only signifies the formation of a stable government, but also revive hopes of a slew of pro-market policy changes that would take Indian markets to new highs in the coming days. Image: Indian brokers engage in trading at a brokerage firm in Mumbai. Photographs: Indian brokers engage in trading at a brokerage firm in Mumbai. "Victory of UPA has given strength to the market players. Investors expect that the forthcoming policies may be pro-market and pro-business. FIIs will show a positive inflow now as there is clarity about the forthcoming government," said Anil Ladha, Head-Capital Markets at ICICI Securities. Though retail investors might still wait for a recovery of the overall economic condition, FIIs, which control almost 60 per cent of trades in Indian stocks, are expected to inject fresh capital. Market participants said that a surge in FII inflows would certainly help to tame the bulls over the coming few months. Tracking the trend in local stocks, the Indian rupee surged stronger by 152 paise or 3.08 per cent to a five-month high of 47.88/89, posting its biggest gain in almost 11 years against the dollar, on hopes of heavy capital inflows, prompted by a clear mandate for the Congress-led UPA in the Lok Sabha elections. The domestic currency breached the 48 level and touched this level not seen since December 19, 2008. The Indian benchmark zoomed by 2,110.79 points or 17.34 per cent in response to the emerging political stability in the country after the general elections. The Interbank Foreign Exchange (forex) market witnessed fairly active trade this morning as the local equity markets hit the upper circuit filter, leading to suspension of trading twice after the election mandate generated euphoric conditions in Indian markets. The Indian unit moved in a range of 47.75 and 48.65 after resuming with a wide gap of 92 paise at 48.48/52 a dollar from its previous close of 49.40/42 a dollar. Forex dealers said the exchange market was in an upbeat mood with strong indications of heavy portfolio investments, which analysts estimated at about $50 billion through FDI, ECB and equity. The government is expected to push forward the reforms agenda paving the way for increased capital inflows, the prime driver for the rupee. 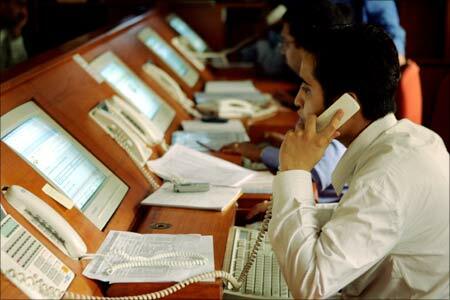 Image: An Indian broker monitors stock prices during trading hours at a brokerage firm in Mumbai. Investors have become richer by a whopping Rs 6.5 lakh crore (Rs 6.5 trillion) in just a minute as the Bombay Stock Exchange Sensex saw a historic 2,111 point rise to the 14,000 level as the markets cheered the decisive win of the ruling UPA government in the Lok Sabha elections. Investor wealth, measured in terms of the combined market capitalisation of all the listed companies, increased by over Rs 6,56,477 crore (Rs 6.56 trillion) in a minute -- in the first 30 seconds and then after the resumption of trading at 1155 hours -- to Rs 44,63,420.97 crore (Rs 44.634 trillion). The 30-share Bombay Stock Exchange Sensex zoomed 1,305.97 points at 13,479.39, hitting the upper circuit within seconds of opening of trade, following which trading was halted for two hours. 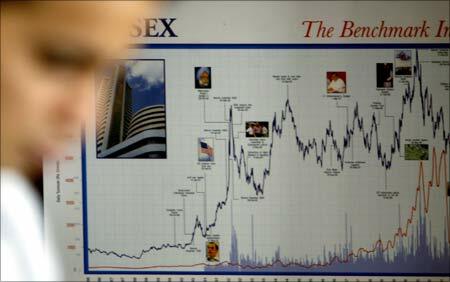 After trading resumed the Sensex soared 806 points at 14,284.21, following which trading was halted for the day. Further, the 30 Sensex companies, which account for over 47 per cent of the total market capitalisation of all the firms, saw their combined market valuation rise by over Rs 3.16 lakh crore (Rs 3.16 trillion) today. The combined market capitalisation of the 30 blue-chip stocks rose to Rs 21,53,590.09 crore (Rs 21.536 trillion) today, from Rs 18,36,841.33 crore (Rs 183.68 trillion) at the end of trade on Friday. Reliance Industries was the major contributor to today's increase in market capitalisation for regaining the 14,000 level along with other heavy-weight stocks like BHEL and Bharti Airtel. Image: A happy investor reacts as he speaks on the phone. 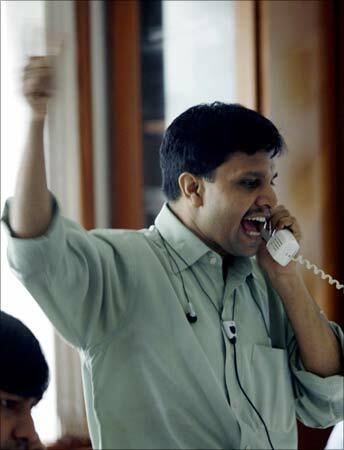 Photographs: A happy investor reacts as he speaks on the phone. Investors cheered the decisive win of the UPA government in the general election as all major index stocks witnessed a massive surge, with Reliance Communication and Reliance Infrastructure emerging as the top gainers after a jump of 20 per cent each in the early trade. The top five index-gainers in today's historic rally were -- Anil Ambani group firms Reliance Communication and Reliance Infrastructure, engineering major Larsen and Toubro, the flagship company of Jaypee Group Jaiprakash Associates and country's largest private sector lender ICICI Bank. Explaining the surge, Ashika Stock Brokers Research Head Paras Bothra said after the uncertainty was over regarding the outcome of the general election, investors rushed to the markets and huge buying spree emerged. The positive trend is likely to continue during the trade and may only go upward from here. Reliance Communication gained 19.72 per cent to touch a high of Rs 278 on the Bombay Stock Exchange. Another ADA Group firm Reliance Infrastructure was up 19.96 per cent to Rs 982 on the BSE. Engineering and construction major Larsen & Toubro surged 18.81 per cent to a high of Rs 1,174 on the BSE. While, Jaiprakash Associates gained 17.99 per cent to Rs 165.90. ICICI Bank witnessed a massive surge of over 19 per cent to touch a high of Rs 684. Other major gainers in the index were -- BHEL (17.16 per cent), DLF (16.62 per cent), Sterlite Industries (16.53 per cent) Hindalco Industries (15.06 per cent), Bharti Airtel (14.53 per cent) and State Bank of India (14.31 per cent). All the sectoral indices were trading in the positive zone, with realty, bankex, consumer goods, power, metal, oil and gas scrips rallying in the range of 10-16 per cent. Markets were predicted to surge today -- the first trading day after the announcement of the general election results -- which showed that the UPA would now be able to form the government again, without the Left's support this time. 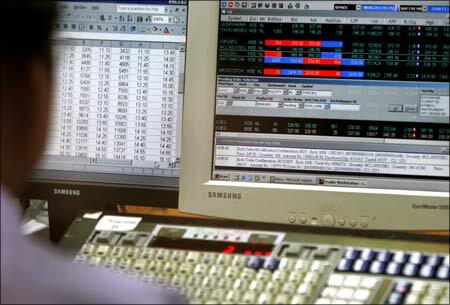 Image: A broker looks at his online trading screen at a brokerage firm in Mumbai.